Last weekend was my first time taking an actual summer vacation – visiting the Hamptons with family and friends. Even though it was only for three nights, the trip rewarded me with a sense of relaxation (aka time away from Boston) I desperately needed. Nonetheless, I never surrender my desire for cooking even when on vacation (if I have access to a kitchen, that is). My aunt allowed me to take the reigns on dinner for one of the nights, and you can only imagine my excitement when she brought home 2 pounds of frozen lobster. 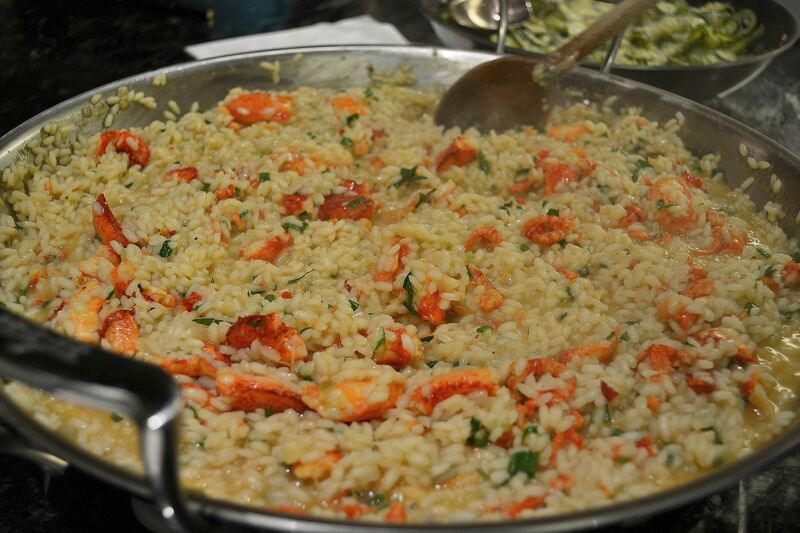 With fresh herbs and aromatics from the local farmer’s market, I decided to make Lobster Risotto. The other wonderful thing about this risotto was the pan I got to cook it in: an All-Clad paella pan. 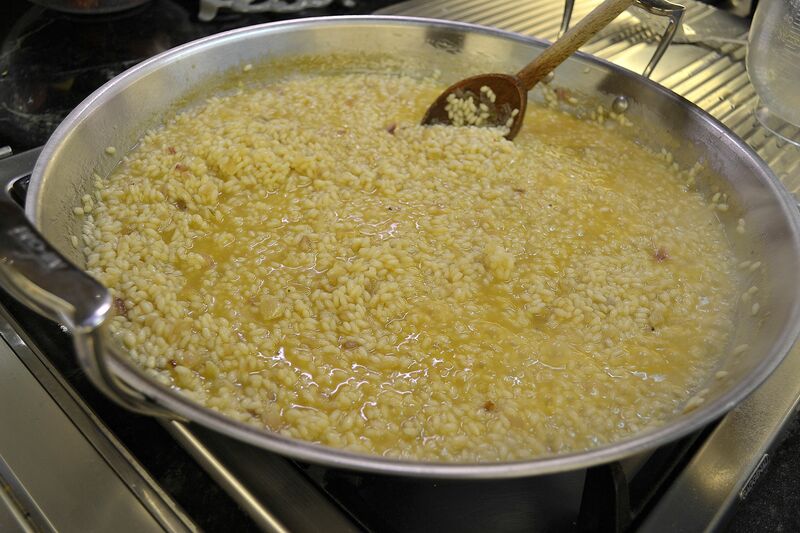 Risotto is a dish that take patience, making sure the timing is just right. But this pan made that process a much simpler one, no doubt. If there is a Santa, this is on my wishlist! 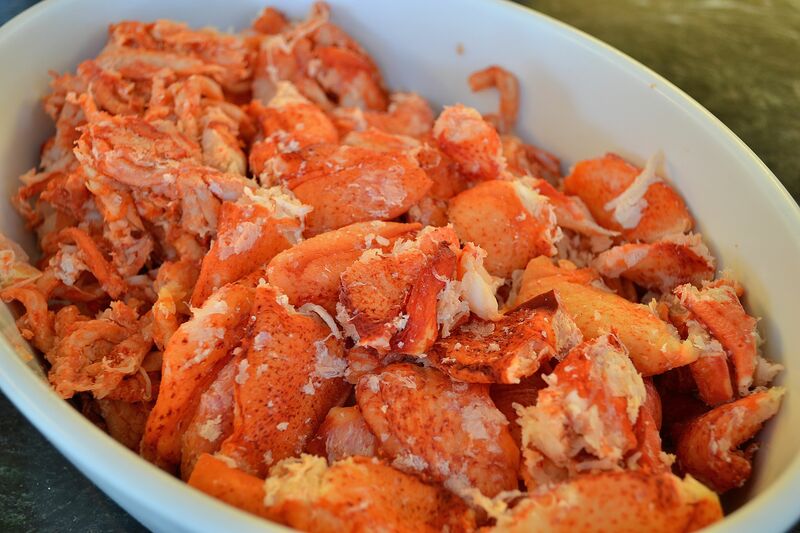 The recipe (aside from the lobster) is pretty basic, yet makes a LOT of risotto – bear in mind I was preparing a meal for 9 people. It can easily be halved to serve 4 or 5. Click HERE to learn how to make this delicious, creamy risotto! While visiting that local farmer’s market, I was drawn to the ruby cherries on sale. 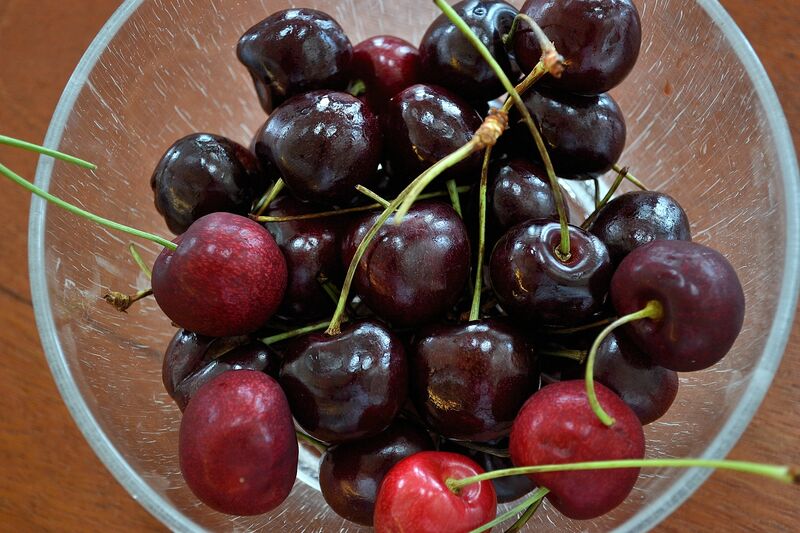 Cherries are an innately beautiful fruit, boasting great color and shape. 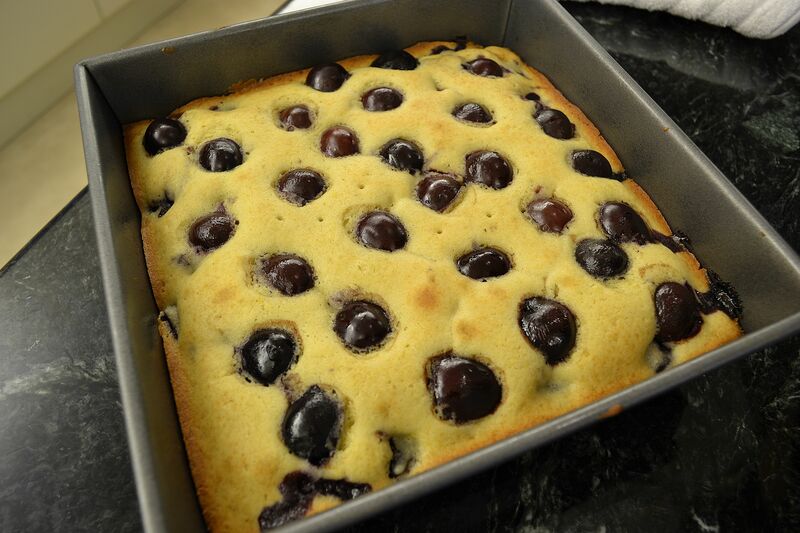 These characteristics helped to inspire my dessert course – Fresh Cherry Cake. I wanted a simple context to amplify the aesthetic look of the fruit, yet a complimentary flavor to augment their fresh taste. An almond cake (adapted from my favorite Joy of Baking), was the perfect answer! Click HERE to see how to make this simple yet stunning dessert! I have always found the cello to be my favorite for times of relaxation (perhaps because it is the closest to the timbre of the human voice), and I wanted my musical selection to reflect my vacationing mindset . So I chose Luigi Boccherini’s Cello Concerto in B-flat No. 9. Being a cellist himself, Boccherini truly captures the instrument’s voice through this piece. ** The ornate, fluid style of this work also helped lead to my pairing, and its almost playful charm as well. The recording I’ve included is by cellist extraordinaire Jacqueline Mary du Pré performing the first movement. I hope you enjoy!